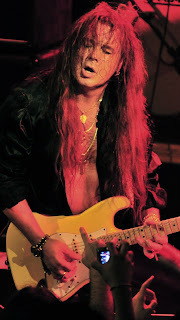 Yngwie Johann Malmsteen (pronounced ING-vay MAALM-steen in English) (born Lars Johan Yngve Lannerbäck on June 30, 1963) is a Swedish guitarist, composer, multi-instrumentalist and bandleader. Malmsteen became notable in the mid-1980s for his technical fluency and neo-classical metal compositions, often incorporating high speed picking with harmonic minor scales, diminished scales and sweep picked arpeggios. 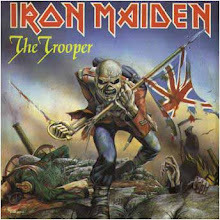 Four of his albums, from 1984 to 1988, Rising Force, Marching Out, Trilogy, and Odyssey, ranked in the top 100 for sales. Malmsteen was born in Stockholm, Sweden, as the third child of a musically-inclined family. At age seven, he saw a television news report on the death of Jimi Hendrix, an event which had a profound impact on his musical path. To quote his official website, "The day Jimi Hendrix died, the guitar-playing Malmsteen was born". At the age of 10 he took his mother's maiden name Malmsten as his surname, slightly changed it to Malmsteen, and Anglicised his given name Yngve to "Yngwie". Yngwie also created his first band "Track On Earth" at the age of 10, consisting of himself and a friend from school on drums(Armin) . Malmsteen was a teenager when he first encountered the music of the 19th century violin virtuoso Niccolò Paganini, whom he cites as his biggest classical music influence. Through his emulation of Paganini concerto pieces on guitar, Malmsteen developed a prodigious technical fluency. Malmsteen's guitar style includes a wide, violin-like vibrato inspired by classical violinists, and use of such minor scales as the Harmonic minor, and minor modes such as Phrygian, and Aeolian. Malmsteen also cites Ritchie Blackmore of Deep Purple, Brian May of Queen, Steve Hackett of Genesis, Uli Jon Roth, and Alex Lifeson of Rush as influences.